Visit Wild Jackpots Casino - Collect 90 Complimentary Free Spins! The Wild Jackpots online casino is one of the latest brands that has been launched by Malta's GoWild. Having already built their very first GOWild casino into a valued and trusted online casino brand, they decided it was time to expand their vision and so came the birth of Wild Jackpots. Wild Jackpots is an exclusive Microgaming casino and as one would expect it comes fully loaded with over 600 of the company's top premier titles. Players can choose to use Microgaming's Viper download version or opt for their equally secure and stable light weight browser version. Those who wish to be entertained on the go, can gain easy access to their mobile version, just by sending an email. For new players looking to see what is currently on offer, now is the time to double up on spins and wins this month and get ready for good fortune in the form of Microgaming's latest slots Lucky Twins. This enchanting and exciting new fun slots was released earlier this month and already has spun its way into many players hearts with its amazing features and bonuses. On this beautifully designed Asian themed 5 x 3 reel, 9 payline slots, there's the chance to discover the brilliance of good fortune, harmony and wealth, along with the beauty of colors that all adorn this game. Lucky Twins presents players with wins up to 25,000 coins with yet another charming game interface that Microgaming fans have become accustomed to. Lucky Charms take their place represented by tassled Coin Pouches, then there's the happy Meneki Neko Cat that beckons good fortune, along with miniature Golden Dragons capturing the attention with their sparkle, as one breezes through with the game-play. 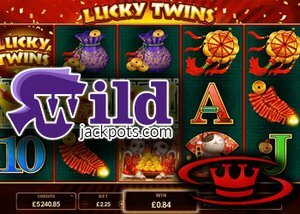 Now is the chance for a double dose of good fortune at the Wild Jackpots online casino where players of the Lucky twins slots game can collect 99 Free Spins as well as 500 Loyalty Points, with No Deposit required. Not only that but new Canadian players can also pick up CAD 300 and 2000 in Loyalty points as part of these exciting new Welcome Package Bonuses. Players go on chat to be guided by a rep fo their Free Spins bonus first, and now's the opportunity to experience their customer service first hand, before even starting a game. Lucky Twins is destined to be another favorite, enjoy the Free Spin Action while you can!